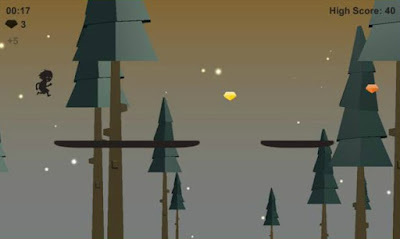 Two of the more popular gaming genres on the Android platform are the endless runner and endless jumper game types. In these games, you are tasked with moving either forward or up through a level and attempt to survive as long as possible. As you move through the level, things get more difficult, and your skills are pushed to their maximum. This offers a great way to play on the go because you can pick the game up and play for just a couple of minutes and still have a great time. Today we’ve picked one of our favorite endless runner games, called Run Away Kid. It is created by Kazapp, a developer team who did a great job in making a beautifully designed game, with cool character and amazing backgrounds and sound effects. Although the gameplay is simple, it is quite addictive. Your goal is to run through the forest and get as far as you can. Tap with your finger and jump – or else you’ll lose. Restart it whenever you want to and don’t forget to collect as many gems as you can. Run Away Kid features 29 achievements and 3 online game leaderboards where you can compare your scores with other players. Download it today for free from Google Play and have unlimited fun!